It was 40 years ago today... Um, well. OK, let's hold the fanfare. Unlike the 40th anniversary of The Beatles' Sgt. Pepper's Lonely Hearts Club Band, there were no memorials or tributes pouring out when the Rolling Stones' psychedelic opus Their Satanic Majesties Request turned 40 on Dec. 8, 2007 (Dec. 9 in the U.S.). We know all of the above, of course, because rock critics have handed down these pronouncements for eons. And when you listen to Satanic Majesties within the context of the Stones' albums, the critics do have a point. This isn't your classic Stones album. It sorely lacks classic guitar riffs, snarling vocals and hard-hitting rhythms. Instead, it resounds with trumpets, strings and enough percussion to make Santana jealous. And even if you altered the arrangements, the ten songs that make up this album wouldn't sound anything like classic Stones songs anyway. And that's why Satanic Majesties is arguably the boldest piece of work the Stones ever conceived. Despite its flaws, it's a radical departure from the norm that few artists have ever attempted. For one time only, it seems, The Stones ditched their monochromatic sound and worldview for a multihued, anything-goes mindset that really was "like a rainbow," to paraphrase the disc's only major hit song. I didn't know anything about the album's history or bad reputation when I was 13 in 1978 and found it wedged away in the back of a closet in my grandmother's Brooklyn, New York apartment. The album, I learned, had belonged to my uncle Joey, a musician, who used to play it for me when he babysat (I recall enjoying "She's a Rainbow"). When I reunited with the (exact same!) album in eighth grade, the first thing that struck me was how it seemed to deliver more than just music. Satanic Majesties seemed like a gateway into the unknown – a strange mysterious world of the past with endless possibilities, ideas and mysteries. The lyrics to "Sing This All Together" about "opening our heads" and closing our eyes to "see where we all come from" seemed a bit naive – but not much more than some of the ideas I'd heard expressed on Beatles records ("Say the word and you'll be free," "All you need is love," etc.). The life-after-death conceit of "The Lantern" kept me listening over and over to the lyrics, wondering what they meant. Then there were the sounds. I could go on and on about the sounds. There are trumpets, flutes, recorders, processed vocals, tape loop effects and even an eerie tolling bell (the first sound heard on "The Lantern"). The great, ominous orchestral sounds in "2000 Light Years from Home," I later learned, were made by a device called the Mellotron and played by the late Brian Jones. The sound of the album was so markedly different than anything I had heard up to that point, it left me in a permanent state of intrigue. Why didn't other music sound like this? Why were bands content to use just guitar, bass and drums? And how cool was it to have an eight-minute song that sounded like they made it up as they went along? I thought it was all pretty damned great and remember thinking Sgt. Pepper, which I also owned, sounded stiff and quaint by comparison. Eventually, I'd discover there were a lot of artists who pushed boundaries and would embrace artists like Captain Beefheart and The Velvet Underground. But I have Satanic Majesties to thank for opening my mind in the first place. So I set out on a quest to learn about "Satanic Majesties." I didn't get far. There was no Internet then, there were precious few rock books even written in 1978 and no one in the arid suburban town where I lived knew what the hell I was talking about when I mentioned Satanic Majesties. My uncle, who had owned the album I now possessed, was now playing bass in a post-glam band called The Brats ( an offshoot of The New York Dolls) and wondered what on Earth I was doing listening to anything but new wave. Searching my other Stones albums for clues confused me even more. Not one single song from Satanic Majesties had made it onto the Hot Rocks greatest hits collection, and the band's then-current release, Some Girls, sounded like it was a progression from the Hot Rocks songs and had nothing to do with Satanic Majesties. All these years later, I think the album's sense of total dislocation in terms of the Stones' oeuvre is its best quality. A bit of history is in order. 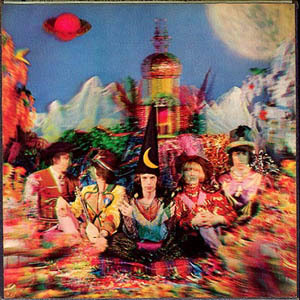 Their Satanic Majesties Request was released just as the psychedelic music era was coming to a close in late 1967. The past two years had seen lots of bands doll up their sound, crafting albums that were incrementally more ornate and lyrical. For most major bands, you can see their work progress in some sort of logical manner. The Beatles' Sgt. Pepper, of course, built on their previous Revolver and led to the music of their later period. The Who's Sell Out album was also an elaboration on their A Quick One album and featured musical ideas that later wound up on Tommy. Love's Forever Changes built on the acoustic flourishes of Da Capo and even The Beach Boys' oddball Smiley Smile had the band's classic harmonies and references to everyday Americana. For most of these albums, the songs weren't all that different from the bands' previous efforts; it was the arrangements that had changed and became grander. The Stones were having none of that for Satanic Majesties. Here, they morphed into a different band, much the way XTC did when they developed their psychedelic "alter ego," The Dukes of Stratosphere. There is no song on Satanic Majesties that could ever have easily fit on another Stones album. The rocking "Citadel" comes close, but its angular, stop-start rhythms and metaphorical, storybook lyrics (ostensibly about Andy Warhol's New York City scene) are far from typical Stones fare. Also, the R&B drive that fuels almost every other Stones LP is completely missing. Songs don't plow over you; they slowly seduce you with art rock arrangements. Brian Jones purportedly plays no guitar at all on this album. The mold-breaking qualities of Satanic Majesties spawned a cult audience, but not amongst most Stones fans. This album tends to turn up in the collections of psychedelic music or art rock fans. One high-profile enthusiast is Peter Gabriel. The former Genesis front man said in the Jan. 1983 issue of Trouser Press magazine that "For me, Satanic Majesties is far more interesting than (The Stones') other albums because they were trying to do something a little different. But they got so slagged off by the press and avoided by the public that they decided, I think, never to take such a risk again. That's a pity." The album's lyrics are also different than anything in the Stones' catalog. Mick Jagger shook off all the macho blues posturing of the band's previous work to delve completely into the world of fantasy. This was a major change. Unlike most bands, the Stones didn't just tart up their love songs with flamboyant imagery or peace and love platitudes. As such, there can be no comparison of Satanic Majesties with the band's previous album Between the Buttons. While Buttons has its share of acoustic arrangements, its lyrics are probably the most vitriolic in the entire Stones' catalog (the deceptively melancholy-sounding "Backstreet Girl" offers what might be the cruelest lyrical conceit Jagger ever devised). On Satanic Majesties though, the singer's aggression is dissipated. Instead, he seems to channel poetry and short stories from (presumably) the English books he read in his youth. He pulled this off with more imagination than most people gave him credit for. On "2000 Man" and "2000 Light Years from Home," Jagger develops elaborate sci-fi themes that make insightful moral statements about humanity. The former song was covered by Kiss and the latter may well have served as the inspiration for David Bowie's landmark "Space Oddity." "She's a Rainbow" is one of the very few unapologetic love songs in the band's catalog and even if Jagger did steal the idea from Love's "She Comes in Colors," he does more with the analogy. The lascivious "On With the Show" is the album's one nod to woman-baiting, but its astute look at working class customs rivals Frank Zappa's similar "America Drinks and Goes Home" for sociological insight. The album also contains a track by Bill Wyman -- the only song by the bassist to get an airing on an original Stones album. "In Another Land" compliments the space-age themes of the other songs well and even got released as a single. A hyped-up backing vocal by the late Steve Marriott and some spacey sound effects make for a clever juxtaposition against Wyman's sleepy vocal, which describes a hallucinatory dream. The tremolo effect that was applied to Wyman's voice still grabs my attention after all these years. That's the relatively normal stuff. There are also two so-called "problem tracks" on this album that are absolutely hated by Stones fans, at least according to the opinions voiced on various Internet fan forums. The songs "Gomper" and "Sing This All Together (See What Happens)" are largely improvised and largely dissonant and/or atonal. Roll over, John Cage and tell the Art Ensemble the news. If you're expecting Exile on Main Street, these tunes won't do it for you. But anyone who enjoys the improvisational jams on albums by The Godz, The Mothers of Invention or The Grateful Dead will find these tracks suitably atmospheric (and atmosphere is largely what psychedelic music was all about). "Gomper" begins as an exotic Eastern-sounding ballad but evolves (or devolves) into free-for-all chaos, with lots of frantic recorder playing by Jones. "Sing This All Together (See What Happens)" lives up to its title, being almost totally improvisational. It begins with a bit of studio chatter (Jagger hilariously asking "Where's that joint?") and tromps through eight minutes of horns, chanting, shouting and exotic percussive beats. Both songs are so removed from anything The Stones ever did, no casual listener would ever think they were done by the group behind "Satisfaction." There's even an unlisted track tucked away at the end of side one – possibly the first hidden track on any major rock album. "Cosmic Christmas," is a spooky version of "We Wish You a Merry Christmas" performed on mellotron by Bill Wyman and rendered almost unrecognizable ("Cosmic Christmas" was also purportedly the original title for the LP). What all this adds up to is the fact that The Rolling Stones had a lot of audacity to unleash an album like this on fans that had been with them for barely three years. Satanic Majesties presented more of a challenge to Stones fans than any album by any major act (save maybe Lou Reed's dissonant Metal Machine Music), because its contents are so utterly unexpected. It's as if you went to meet your womanizing tough-guy friend in a bar and unexpectedly found him sitting beside a lake, sobbing because the exquisite beauty of a swimming nymphet was too much for him to bear (a scenario that comprises the storyline of "Gomper"). Whether the Stones meant to create a totally aberrant piece of work is another matter. At the time, their longtime manager and producer Andrew Loog Oldham had jumped ship (or was thrown overboard), leaving them to produce this album themselves (though they would soon hook up with the talented Jimmy Miller). Jagger, guitarist Keith Richards and Jones were all having problems with the law (documented extensively elsewhere), so the album was done in bits and pieces between court dates and jail time. Nevertheless, they still saw fit to throw Satanic Majesties out there. Had the Stones included the songs from their recently-released single, "Dandelion" and "We Love You," on the album, it would have made more palatable listening (especially if these two songs had replaced the troublesome ones). These tunes were likely not included because they were produced by the departed Oldham, and because many UK acts didn't put singles on LP's back then (and maybe because the later song was too sarcastic to match Majesties themes). Maybe in retrospect, the Stones' worst move was utilizing the services of Sgt. Pepper cover designer Michael Cooper to craft their own cover (originally done in 3-D). This led to charges that they were "ripping off The Beatles." Not quite. The Fabs' effort was a carefully-conceived, deftly-focused project, a culmination of everything they had done. The Stones' album, by contrast, was anything but. That's its beauty.